tiɬ - absolute straightness (no bend or curve) which in math is a truth (geometry) the one true distance between two points- which is an exact straight line. tɬtaɬt is translated as “truthful” though its literal meaning is “Very Straight or only Straight” so absolute straight- no crookedness in any way involved. The En’owkin Centre was established as the Okanagan Indian Curriculum Project in 1972, and in 1983 was incorporated as a non-profit society under the name of the Okanagan Indian Education Resources Society. En’owkin Centre acquired Theytus Books, a limited company in 1985, for the Purposes of Publishing Indigenous Materials in Authentic Indigenous Voice, and as a complement to the En’owkin Centre International School of Writing. The En'owkin Centre became a recognized Cultural Centre in 1988, and became accredited as a Private Career Training Institution for the implementation of its Post-Secondary Mandate in 2005. It undertook as well to partner with the University of Victoria, the University of British Columbia Okanagan, the Nicola Valley Institute of Technology, and Okanagan College, for delivery of publicly recognized and accredited training. The Centre has been active at the local, national, and international levels in the preservation and revitalization of Okanagan Language and Culture, and Broader Indigenous Cultural preservation and revitalization for more than 40 years. 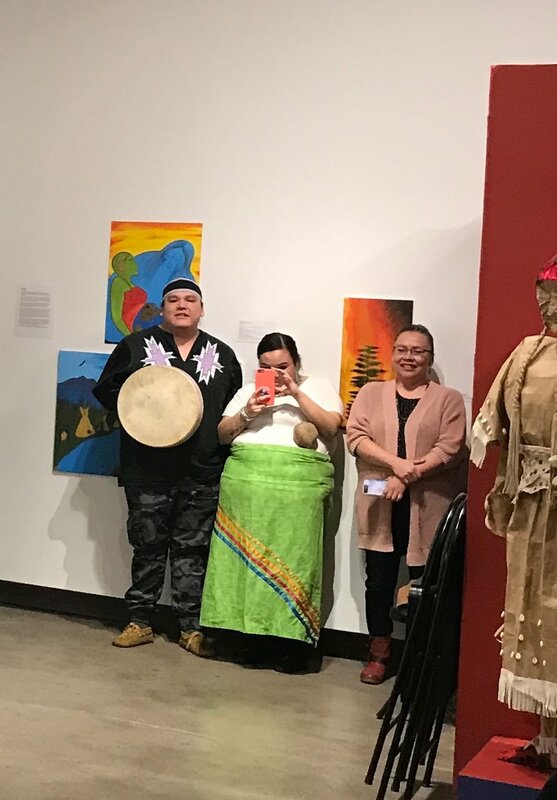 The En'owkin Centre continues to thrive as a dynamic cultural, educational, ecological and creative arts institution, which puts into practice the principles of self-determination and the validation of cultural aspirations and identity. The En'owkin Centre provides a culturally sensitive learning environment in a nurturing and challenging atmosphere. En'owkin Centre is a leader in the development and implementation of Indigenous knowledge and systems, at the community, national and international levels. The word ‘en'owkin’ is an Okanagan concept, which describes a respectful dialogue for clarification, conflict resolution, and group commitment, to come to the best solutions; essentially, consensus. This exhibition is part of an ongoing series of annual exhibitions, which explores and celebrates the incredible culture and diversity embodied by the En’Owkin and its inspired faculty. A special debt of thanks is due to all the participating artists for their trust, belief and support; and to Dr. Michelle Jack, Dr. Gregory Younging, Lauren Terbasket, Tracey Kim Bonneau, Richard Armstrong, Corinne Derickson and Dr. Jeannette Armstrong for their continued and ongoing support in building this important cultural bridge between our two communities.